Brief Synopsis – Documentary about the life and tragic death of an photojournalist kidnapped by ISIS. My Take on it – This is a film that I came across by accident a few weeks back and when it was nominated for an Oscar for Best Original Song, I was a bit surprised, but still intrigued to see what it was all about. They do a nice job explaining to us the chaotic and dangerous life that a photojournalist leads and some of the footage is quite intense which helps us understand even more what they deal with day in, day out. 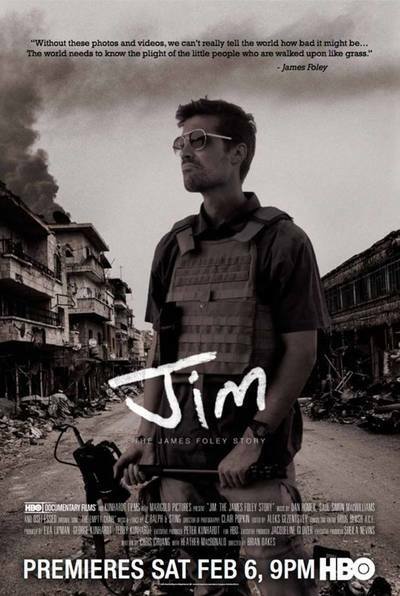 We are easily given a look at the intense life that James Foley lead and how he personally dealt with it all via interviews with his family, friends and colleagues. Their stories from these interviewees help bring his life to a more personal level and we can get much more of an understanding of who he was. The closing song The Empty Chair by Sting (which in nominated for an Oscar for Best Original Song) is quite a moving song and works well here, but it unfortunately feels a bit like it was tacked on to slightly manipulate us. Bottom Line – Does a nice job presenting the dangerous and chaotic life of the photojournalism profession. We get an intimate look at Foley’s life via intense interviews with family, friends and colleagues. The closing song by Sting is quite poignant but feels tacked on a bit. Recommended! tnx 4 stopping by and commenting!